Dean Harrison upped the ante at this year’s Isle of Man TT with two blistering 133mph laps on just the third night of practice. The Yorkshireman, who topped Monday’s first superbike session with a 131.376mph, came out of the blocks flying to set his quickest ever lap of the 37.73-mile mountain course with a 133.140mph from a standing start. He’d then improve his pace on a flier, becoming the only man in TT history other than Michael Dunlop to set a sub-17 minute lap with an average speed of 133.462mph. Dunlop himself hit 132.319mph on his first lap before two slower laps on the Tyco BMW Superbike, while the second Tyco machine of Dan Kneen was third fastest after the evening session having lapped with an average speed of 132.258mph. 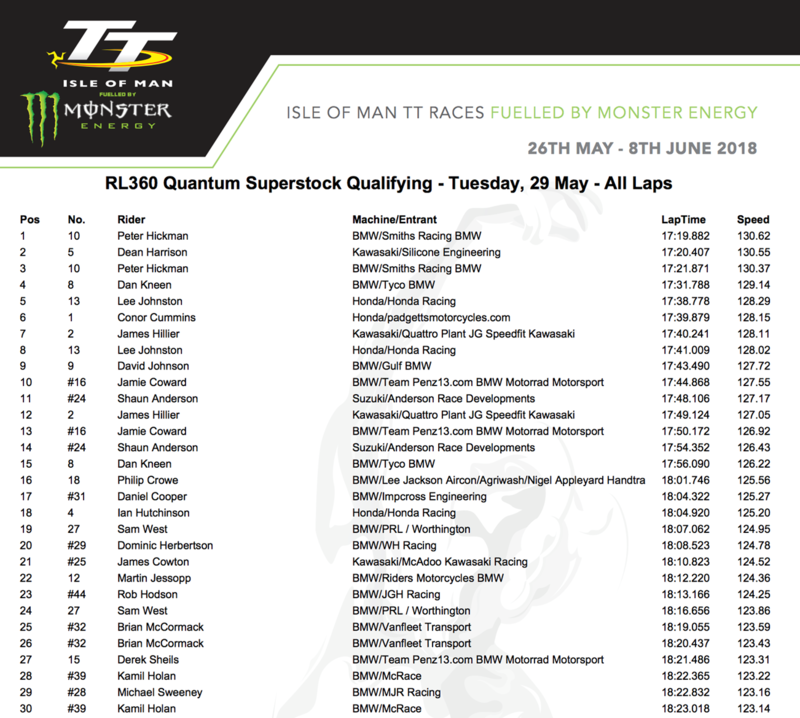 Peter Hickman was fourth quickest for Smiths BMW with a 132.169mph lap, while Conor Cummins rounded out the top five for Padgetts Racing despite not cracking the 130mph barrier. 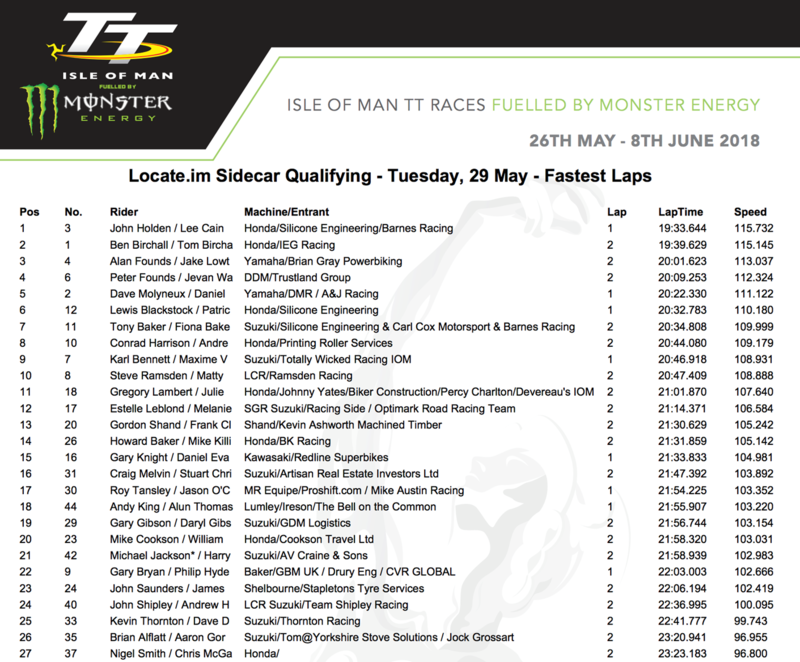 Hickman again lead the way in the Superstock session with a 130.619mph lap, narrowly ahead of Harrison who set a 130.533mph average speed. Dan Kneen was the third quickest stocker ahead of the Hondas of Lee Johnston and Conor Cummins. Michael Dunlop took control in the Supersport class, hitting 125.206mph (slower than Harrison's quickest lap from Saturday) to lead James Hillier and Ivan Lintin but it was a session in which many top stars were hindered with problems, including Harrison and Hickman who were forced to pull over on their Kawasaki and Triumphs respectively. 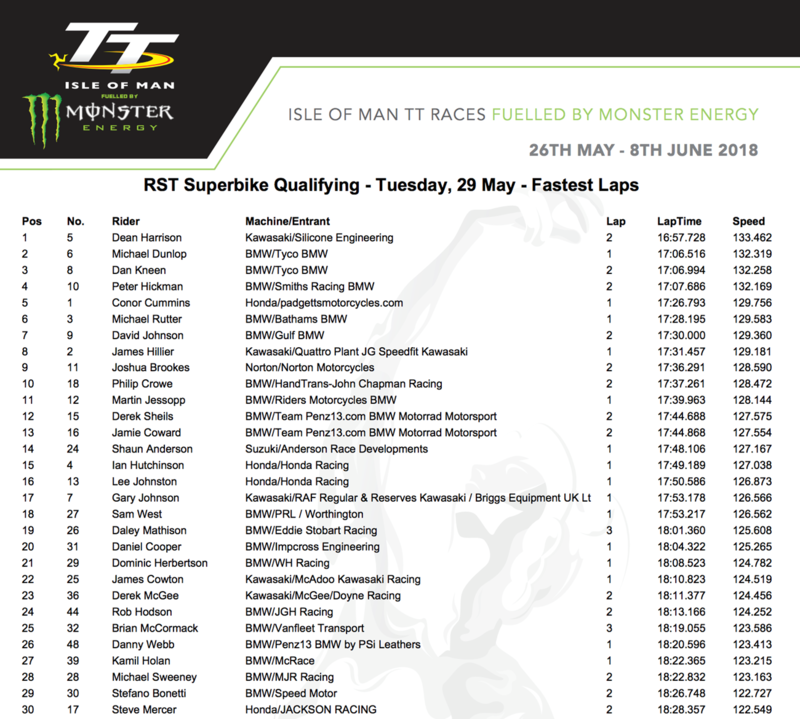 Twice Lightweight TT winner Ivan Lintin led the supertwin times for Dafabet Devitt Racing with a 119.191mph lap to sit ahead of Stefano Bonetti and Adam McLean, while John Holden and Lee Cain and the Birchall brothers posted 115mph laps to top the Sidecar session. Practice resumes on Wednesday evening at 18.20.